For Kim Hong Sung, coming to Nepal on a trekking expedition in the winter of 1990, made all the difference. Overwhelmed by this beautiful Himalayan kingdom that touched his soul, he visited Nepal every year until 1996, when he finally decided to make Nepal his home. Born to Kim Bum Young and Kim Ok-Hee (North Korean refugees during the Korean War) it was difficult for Kim to visualize, leave alone dream of a wholesome life in the extremely competitive and fast lanes of Korea. In comparison, Nepal and its capital city Kathmandu was a haven where Kim’s long search for a key to life ended. “Nepal has something that was swept out of Korea decades ago by the wave of modernization,” confesses Kim who had had his share of frustration and hardship in his native land. He got his first impression of Nepal from the Lungda (Tibetan flag raised on a village hill or Temple grounds to ward off evil), a symbol of humanism and hope for refugees who have lost Shangri-La due to ideological wars, political situations, religious conflicts and materialism, that made him reflect on what real happiness in life meant. “In Korea it is all about earning money from dusk to dawn and people simply don’t have time for anything else. The tension and lack of personal space was too much for me to handle, which is why I guess I have no hair left,” says Kim with smile. He adds, “If I had stayed back, I would have landed in a mental institution”. But despite the fact that Kim now lives a new life full of dreams and aspirations, the bitterness and the grief over the dismal state of his land still reflect in his eyes. There were happy moments for Kim- the first 10 years of his life with his parents. But all good things come to an end, and so did the good life, when he was sent to school and then work thereafter at which point Kim recalls feeling the most miserable. Kim soon realized that life consisted not in holding good cards, but in playing those you hold well. He graduated from Jung Ang University in 1980 with a degree in literary art, specializing in poetry. Although poetry had always been his true passion, he did try his hand on photography (with the assistance of friends specializing in photography from the same university) and started composing Photo Poems. Kim says, “I wanted my photographs to complete my poems, which are based mainly on people’s lives and also because I strongly believe that photographs are a language for world communication”. A man of many talents, Kim also published several books in the Korean language where he gave accounts of his trips, travel essays and poems like, “One of the Flower Seeds in Dust”, “The Valley Where Flower’s Blooming” and “A Traveller’s Notes” to name a few. From thereon there was no looking back. His career as a photographer blossomed and he finally got to hold his first solo exhibition titled “The Holy Land, Ladakh” in Seoul, Korea. If you think there were too many achievements for Kim, well— there were failures too. “I never got though middle school, high school, first job or for that matter, my first driving license at the first shot. The only thing I did manage to bag on the first go was my Korean food cooking license,” says Kim with a hearty laugh. All glory comes from daring to start and no one knows this better than Kim Hong Sung, who dared to take that initial step in a foreign land. A believer in The Buddha, he surpassed all odds in subtlety and made every endeavor look effortless. Even though he had now decided to stay back in Nepal, he continued his journalistic career, doing correspondent work for several Korean magazines and newspaper like E-Mountain and NGO Times. However, not all went the way Kim had planned. His inspiring articles on subjects like the little pleasures of life, values and the importance of time were soon rejected with the explanation that nobody in Korea had the time for such things. “I always did what I was told to do and fulfilled everybody’s wishes except mine. Finally when I started doing something for myself, even the rejection of my work didn’t matter. I was no longer a puppet at the mercy of others. I was finally free…” says Kim with a tone of nostalgia. Moving on to higher grounds, Kim together with Finzo Sherpa (friend) and Jeong (wife) took out two volumes of a publication called Himalayan News (1999 and 2000) in Nepal. He then moved on to showcasing his photographs and did two photo exhibitions titled “The Wind Horse” at the Siddhartha Art Gallery in 2002 and “The Land I love” at Gallery Nine in 2004 (of which he is a member too). Adding to his list of credentials I must say that his Korean cooking license too wasn’t wasted. He opened Korean Kitchen Picnic, a delight for Korean food lovers with his wife who shared his passion for food. “I opened the restaurant to generate income because I couldn’t generate much income with photography and writing alone,” humbly confesses Kim. So what has been his major achievement in life? “Nothing spectacular has happened so far but the possibility of achievement in my life started when I decided to stay in Nepal,” says Kim. How did Kim feel leaving behind his roots? What were his inhibitions initially when he planned to settle in Nepal? Was life easy in a foreign place especially since he could not communicate in English nor in Nepali? How did he adapt to the Nepali way of life? Many questions raced through my mind. “Leaving my family behind was very difficult but more than that, carving a niche for myself in Nepal was fun especially since Nepalis are very hospitable and I made great friends, like Phinzo Sherpa, Sri Ram KC and Mani Lama, whom I have great regards for as a photographer,” says Kim. He vividly recalls the early days of trying out Dal, Bhat and Tarkari (stable Nepali diet) “I had no qualms about it since it resembled the kind of food I was used to eating during my early childhood.” He did confess though, that not being able to speak in either the native language, Nepali nor English was initially a problem. But typical of Kim, he found a solution for that too. Taking tutorials for English and learning Nepali through practice, Kim can today speak relatively well in English and can utter those monosyllabic and disyllabic Nepali phrases like “alikati milcha, aunu hos” or for that matter an entire line, “Mero nam Kim ho” (My name is Kim) near to perfection. On the lighter side, scenic Nepal was an asylum for a seasoned trekker like Kim. And his love for traveling seems infectious, as Jeong too accompanies him most of the time, which is why they have named their restaurant Picnic. “We go for a day’s trek almost every Saturday. I’ve walked a lot both within and outside the valley and am well acquainted with most of the places now,” says Kim whom I suppose most people have seen walking down the streets of Thamel and Lazimpat. I do…. Moving on to places outside Nepal, he vividly recalls one of his favorite travels with his wife to the beautiful Queen of Hills, Darjeeling. “Chowrasta (……) felt like a very big ship sailing on the clouds below. 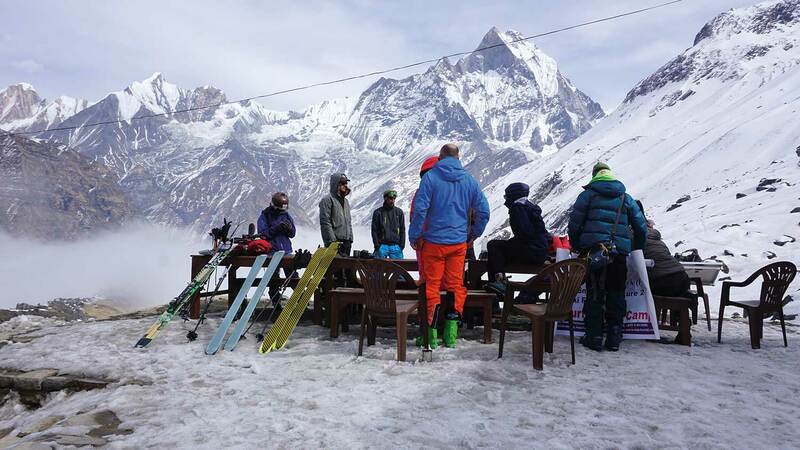 And when the fog finally disappeared revealing the majestic Kanchenjunga (world’s third highest mountain) I felt like I’d reached where I should have,” says the poet in Kim. As JFK once said, “ask not what your country can do for you, but what you can do for your country.” Despite Kim’s discontented life in Korea, he is hopeful that one fine day, a new dawn shall break in his country and things will improve. For that reason alone, he wants to write on how fulfilling and satisfying the Nepali way of life is and present it to his fellow countrymen to make them realize what they’re missing - a chance for a new life. And I guess that’s not all for Kim. We’ll see a lot more of him through his beautiful poems, excellent photographs, and lovely food. Kim and Jeong invited me over for lunch at the Korean Kitchen Picnic the day after the interview. I must say that having never tried Korean food before, dining the Korean way (with Kim’s family and friends) was a new and very pleasant experience. My heartfelt thanks to Kim for sharing his experiences and giving us his valued time.